We used the 2018 BBCOR version of the bat in a few tournaments across several different players with nearly unanimous approval. In fact, the majority, especially those hitters who benefit from faster swing speed, loved the bat. Below is our 2018 Rawlings VELO Review… Jump to the full review. We aren’t the only ones to have information about the Velo. Other places, in particular those who sell bats, usually have a boiler plate write up on the specs of a bat. Many of those we reference to make sure we are seeing what we should be. Here are some more references for the 2018 Rawlings Velo review. We used the 2018 BBCOR version of the bat in a few tournaments across several different players with nearly unanimous approval. In fact, the majority, especially those hitters who benefit from faster swing speed, loved the bat. Below is our 2018 Rawlings VELO Review for baseball. Although terribly difficult to measure, the Rawlings BBCOR line of bats may be the most popular BBCOR bats in the country. And among them, the VELO is the most popular bat Rawlings makes. As such, it could be argued, the VELO is the most popular BBCOR bat on the market. We liked the drop 5 and 10 VELO. We felt the drop 11 lacked enough gumption to make a difference in the box—and its light weight lends to more hand sting. Otherwise, the Drop 5 especially, hits the ball well and is a stiff bat made for serious players that want a wood like feel and performance in a youth bat. The USSSA bats work well for those who want a low swing weight, distinctly loud sound at contact, a price point in line with what many parents are more willing to pay. As well, the bat is hot out of the wrapper—so no questioning whether the bat is broken in and an an impressively long a pedigree as any bat in the BBCOR space. There are no differences, aside from the color, between the 2017 and 2018 Rawlings VELO. We should note, however, the size offerings are different. The VELO can be found in a USAbat this year, and last year those did not exist. The Rawlings Velo was the first bat to use variable wall thickness to create a lighter swinging bat with a bigger barrel in the aluminum space. Since, however, many have flat copied the idea. And although none of those copy-cats have added the POP 2.0 groove to their bat’s inside (like the VELO did for the 2017 and beyond models), we consider those others at least somewhat comparable bats. Do note that the CAT 7 does NOT use a composite end cap. Also note that the Slugger 618 uses a composite end cap on an aluminum bat, but forgoes the variable wall thickness. If you are looking for more insight on the 2018 Rawlings VELO, we suggest our 2017 Rawlings VELO review. That is the most read article on the subject. And, since the 2018 and 2017 are identical in everything but color, you can expect reviews for that bat to be similar to this one. Also, on this site, the 2018 Quatro and 2018 5150 will be worth your time. They are sister bats of the VELO and carry some of the same ideas. Those bat reviews might give you more background on the 2018 VELO. Off this site we think past user reviews on Amazon are mildly helpful. As well, Rawlings’ site directly will be useful too. The Rawlings VELO is a single piece bat that uses variable wall thickness and a groove on the inside of the barrel to create a light swinging bat with a big barrel. Using clever means to decrease swing weight while maintaining durability and barrel size is the principal task of bat engineers. The Rawlings VELO pioneered the technique of using variable wall thickness to accomplish a bigger barrel without affecting swing weight. In the 2017 version, Rawlings rolled out POP 2.0 technology (their term, not ours) which removes even more volume from the inner barrel by creating a groove lengthwise inside the barrel. This managed to drop the swing weight even lower while leaving room for a larger barrel. 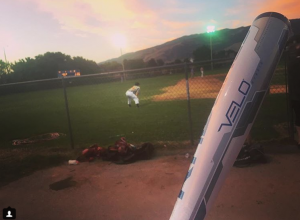 Without argument, the VELO is the most advanced aluminum bat on the market. In addition to the inner barrel make-up, they also use an extended composite end cap to further reduce swing weight.​ This extended composite end cap is their justification for using the word “hybrid” on the side of the barrel. It is not a “hybrid” in the traditional sense of the term, or as we generally use it on this site. That is, it does not have a composite handle and an aluminum barrel. Expect to see the Rawlings VELO in the following models and sizes.